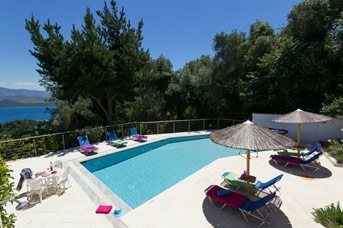 You may find it hard to leave your lovely private Villa Plus pool, but it is worth venturing down to the beach which is ideal for children. It has warm, clear, shallow water ideal for paddling. 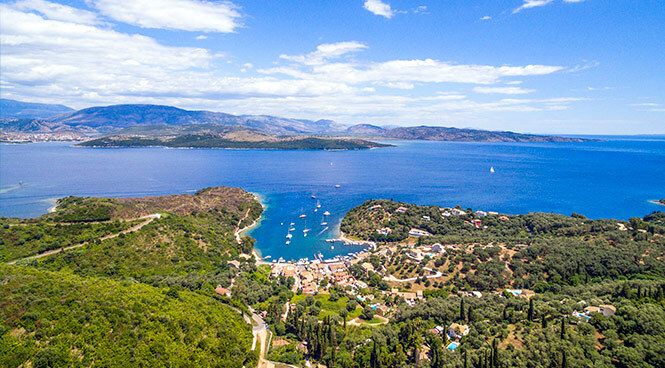 There are plenty of sun beds and umbrellas to hire, wooden jetties for sunbathing or fishing and a beachside taverna to keep you topped up with cold drinks and snacks. If you have a car, it is easy to explore places like Arillas, Agios Georgios Pagi, Roda, Sidari and Acharavi. 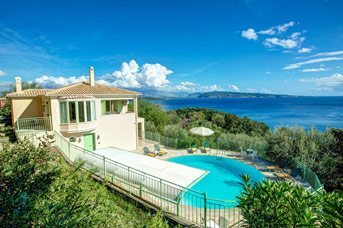 Agios Stefanos is only 22 miles from Corfu Town, so you can get to the capital for a long day out to explore its historic churches, narrow cobbled streets, fine museums, 10th-century fortress, excellent restaurants, bars and pavement cafes and hidden leafy squares. It is as usual to travel by boat as car around here, and you have the option of hiring you own boat from the harbour, a very relaxed and comfortable way to discover the beauty of the North East Coast.You may find it hard to leave your lovely private Villa Plus pool, but it is worth venturing down to the beach which is ideal for children. It has warm, clear, shallow water ideal for paddling. There are plenty of sun beds and umbrellas to hire, wooden jetties for sunbathing or fishing and a beachside taverna to keep you topped up with cold drinks and snacks. If you have a car, it is easy to explore places like Arillas, Agios Georgios Pagi, Roda, Sidari and Acharavi. 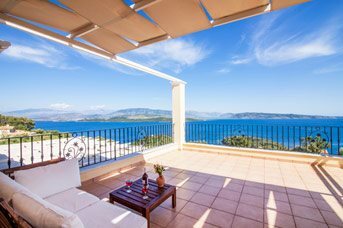 Agios Stefanos is only 22 miles from Corfu Town, so you can get to the capital for a long day out to explore its historic churches, narrow cobbled streets, fine museums, 10th-century fortress, excellent restaurants, bars and pavement cafes and hidden leafy squares. It is as usual to travel by boat as car around here, and you have the option of hiring you own boat from the harbour, a very relaxed and comfortable way to discover the beauty of the North East Coast. Throughout its history Agios Stefanos has been a quiet fishing village, arranged around a deep horseshoe bay full of gently bobbing, brightly coloured boats. Fishing is still a vital part of the economy, so that the village has maintained its identity in spite of welcoming tourism. If you are up early and make your way down to the harbour, you can buy fresh fish directly from the fishing boats as they return with their catch. 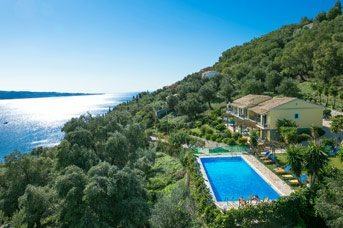 Corfu has been a refuge for many artists and writers, including Lawrence and Gerald Durrell and Edward Lear. Most of us think of Edward Lear as the author of nonsense verse and limericks, but actually he was a painter by profession, (particularly good at painting parrots!) He first visited Corfu in 1848 and the island made a deep impression on him. "I think no place on Earth can be lovelier than this," he said, describing Corfu in 1856, and he was right! The multi-talented brothers Lawrence and Gerald Durrell caused quite a stir when they moved to Kalami with their colourful entourage! Lawrence was a novelist, poet, dramatist, and travel writer whose most famous work is “The Alexandria Quartet”. His younger brother Gerald was a naturalist, zookeeper, conservationist, author, and television presenter, famous for the zoo he founded in Jersey. He also wrote books based on his life as an animal collector and enthusiast such as “My family and Other Animals,” which if you are in your sixties and grew up in the UK you probably studied at school. In March 1935 Lawrence persuaded his new wife (the first of four!) his mother, and his siblings including Gerald to move to Kalami, then a tiny fishing village, so they could escape the grey skies and the constraints of polite English society and live more freely. 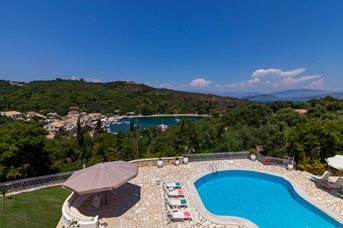 Within a few months they all moved to the White House, a single storey property owned by Anastasios Athinaios, the grandfather of the current owner, Tassos. The building was extended to make room for them all. Some of the Durrell’s most creative work was written here over many years, but today the White House is a hotel with a restaurant serving seasonal Greek dishes using locally reared organic meat and fresh seafood.